Yubico has created a small utility that can secure access to a Windows computer when used in conjunction with a YubiKey. 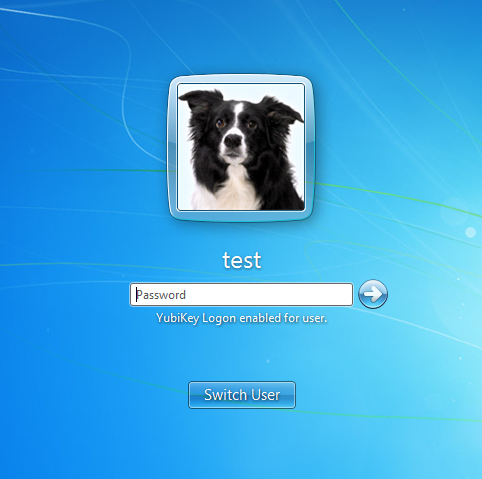 When properly configured, both the user’s password and YubiKey are required to gain access to the account. When using this tool it is highly recommended to configure a second, back-up YubiKey at the same time in the event access to the primary YubiKey is lost. YubiKey Hardware with firmware 2.2 or later. Should you wish to make a back-up YubiKey (highly recommended), please have another YubiKey available. The YubiKey needs to be configured with our Personalization Tools for HMAC-SHA1 challenge-response with variable input in slot 2. For optimal user experience, we recommend to not have “button press” configured for challenge-response. If button press is configured, please note you will have to press the YubiKey twice when logging in. 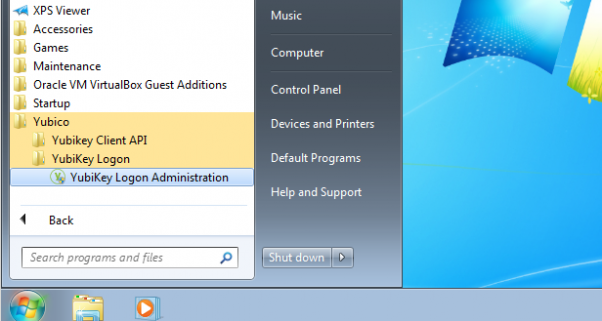 You need to have administrator privileges to be able to install and you need to reboot your computer after the installation. For Step-by-Step instructions, including how to configure your YubiKey in HMAC-SHA1 mode, please see the PDF guide. 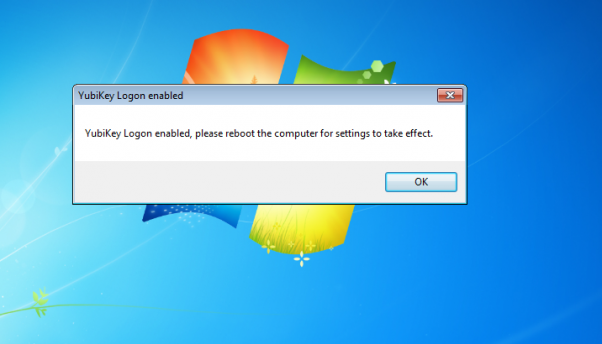 Download the Windows Login installer. Open the installation file and click Install. 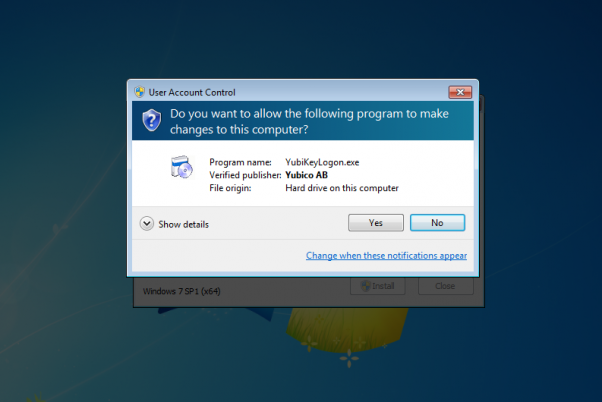 Press Yes in the User Account Control window. 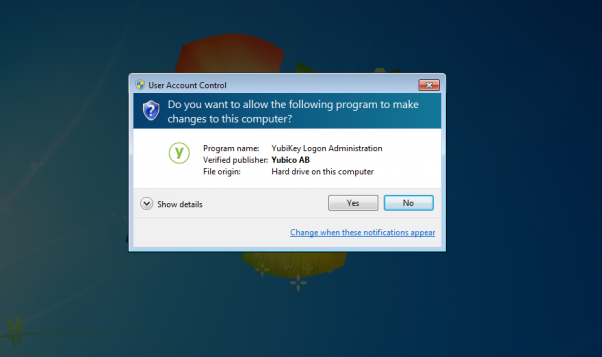 Launch the YubiKey Logon Administration, that can be accessed from the start menu. 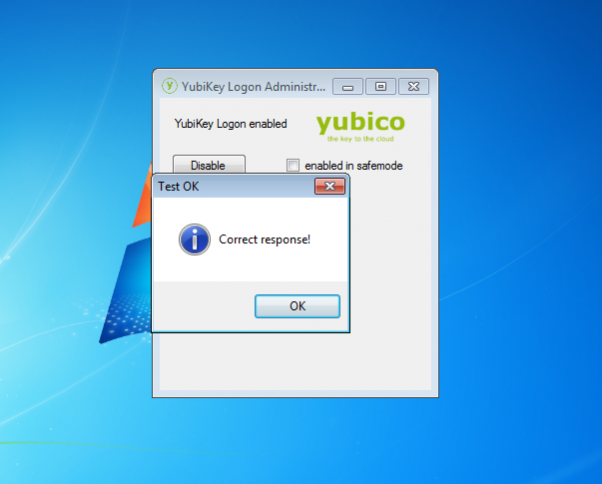 You will find it under the folder Yubico → YubiKey Logon → YubiKey Logon Administration. 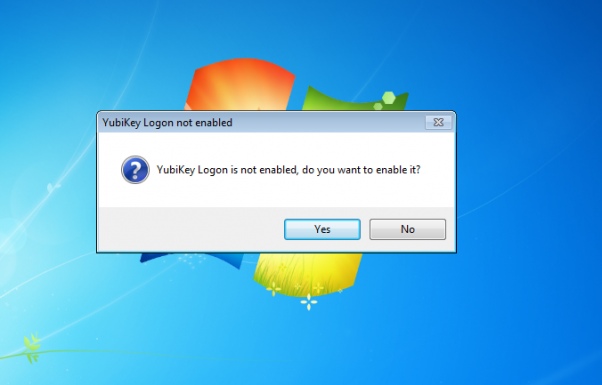 Click Yes to enable YubiKey Windows login for your computer. Choose to reboot now or after associating the YubiKey with a user. 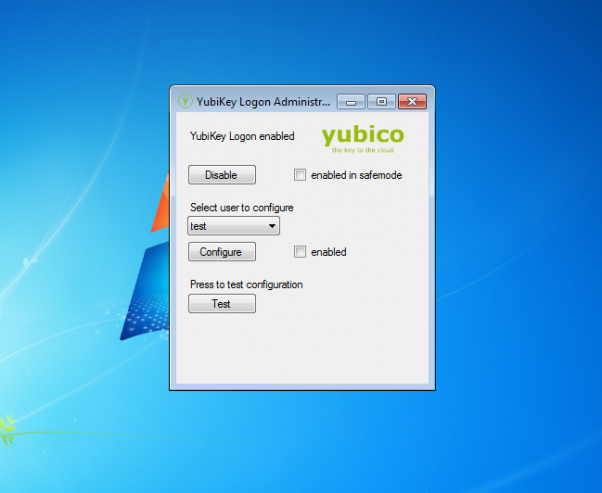 Select user to configure in the drop down menu in the YubiKey Login Administration window. If not already done so, please insert your YubiKey in the computer via a USB port. Press Yes to enable the YubiKey Login for the chosen user. Optional: click test to do a test with the YubiKey. If not already done so, reboot your computer. 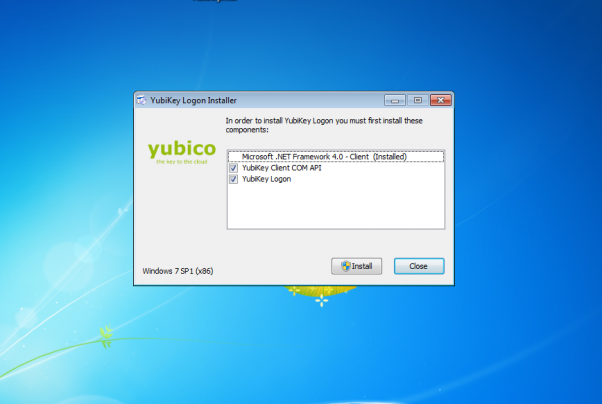 Login to Windows with the YubiKey inserted in a free USB port. Enter your ordinary password (not an OTP from the YubiKey) in the password field. The YubiKey challenge-response will take place without any user interaction.